Vote on our New Notepad Collection Designs! You asked and we listened!! Introducing the runners up for our upcoming notepad release. We’re only going to start out with offering two to four notepad designs so help us pick them out by voting below! You can vote for your top three favorites at this link (http://www.poll-maker.com/QBY9ZGO) or simply write the names of your top three favorite designs in the comments below. We’re also polling in our Instagram stories, so just use the avenue you’re most comfortable with. Do you like the layout / saying of one but prefer the design of another? Speak up and tell us what you like best in the comments below, IG message or via email! Thank you for taking the time to tell us what you love!! This is a fun project for the whole family! On Thanksgiving morning, JD and I gathered the larger pieces of driftwood while Mia Kai collected the smaller pieces in her sand castle bucket. She also found a great collection of pretty seashells that we may add onto our tree later during our stay. It's finally time to order the Jitneys 2019 Agenda!! We've added quite a few new features along with new artwork and a HARD cover! We'll introduce most of the new changes at the bottom of the post. If this is your first Jitneys Agenda, keep scrolling for detailed summaries and photos of the 2019 Agenda!!! Plan each day beautifully and thoroughly with the 176-page planner (88 front and back), bound with gorgeous gold wire spiral binding and featuring a list of nationally recognized holidays, weekly layouts, monthly layouts, an annual layout, area for scripture memory, goal planning and a section for brainstorming and notes in the back. The hard cover boasts a striking floral design with 2019 in gold foil on the front and an inside pocket. Each month is separated by a floral patterned divider with colorful laminated tabs. 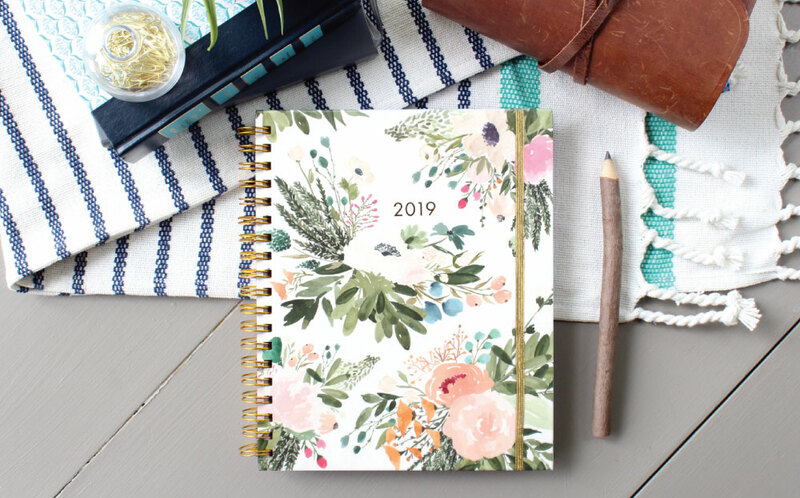 This agenda will fit perfectly in a purse or backpack, and will look stunning sitting on top of your desk. JD was in London the week I found out I was pregnant. I had some random heavy-ish spotting so I called our family physician (who just happens to also be one of my closest friends - we'll call her AK for privacy purposes) and she told me to go ahead and take a pregnancy test. JD and I had been trying for a second child so I was thrilled when the test revealed those two dainty pink lines. However, because of the random spotting, AK suggested that I get some bloodwork done to check hormone levels, etc. I waited until JD returned from his trip before getting my bloodwork taken because I wanted him to be there for whatever the results held. But something in me still felt uneasy about the pregnancy. It doesn’t seem like a long time to be pregnant but, in the one week I knew a precious life was forming inside my womb, the Lord told me to celebrate that sweet little life. JD and I were both hesitant to get excited right away but God kept telling me, “Celebrate this baby. If there comes a time to mourn, I will be with you.” Even with Mia Kai, we were hesitant to truly believe I was pregnant until twelve weeks; yet, the Holy Spirit continued to whisper those words to me: "Celebrate the life. Celebrate the life." Because denial is an unfortunate strong suit of mine, I'm afraid I wouldn't have believed I was truly pregnant if we hadn't take that week to celebrate. It's just another area where Jesus knows my heart better than I know my own. This print holds a very special place in my heart. It was inspired by our friends, Matt and Monique, and their adoption journey. I remember standing in our dining room talking about the little love they had been praying for and awaiting. I began painting one day and their family was instantly laid on my heart.